Hollywood, Cal. 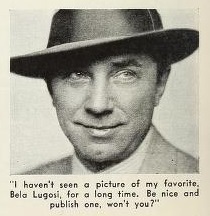 – News of the marriage yesterday in Las Vegas, Nev., of Bela Lugosi, film actor, and 21-year-old Lillian Arch, a bookkeeper, was received today by Mrs. Stephen Arch, the girl’s mother. 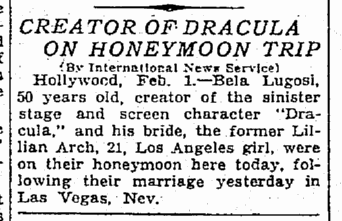 Mrs. Arch said Lugosi and her daughter had been keeping company for two years, but she was unaware of their plans to elope. The romance of the screen actor and his bride, a slender brunette who also is an accomplished singer, was born at parties at the Magyar Athletic Club, where Miss Arch’s father serves as president and manager of the club’s athletic teams. 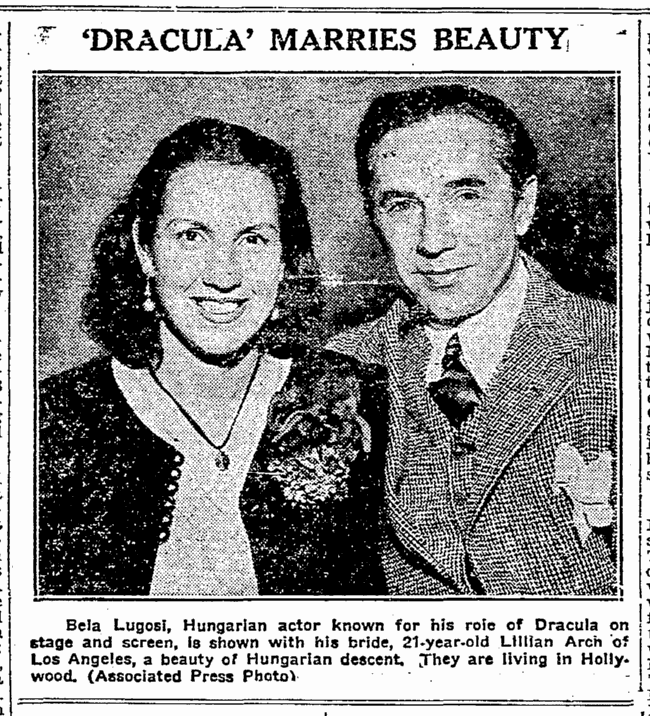 Both Lugosi and his bride are of Hungarian descent. The creator of the screen role of “Dracula,” before becoming an American citizen two years ago, was an Hungarian subject, the son of Baron Lugosi, whose ancestral estates are at Lugos, Hungary. 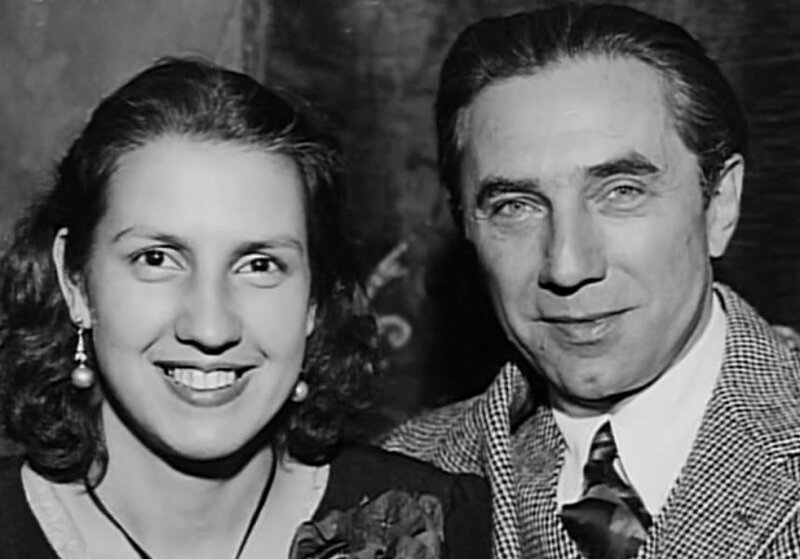 Lugosi’s former wife was Mrs. Beatrice Weeks, San Francisco, who lived with him only four days. Mrs. Weeks obtained a divorce at Reno. 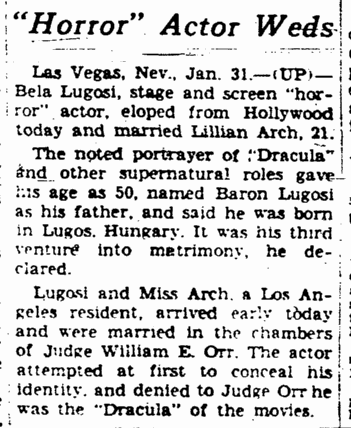 Las Vegas, Nev. – Bela Lugosi and Lillian Arch of Los Angeles were married here this week. 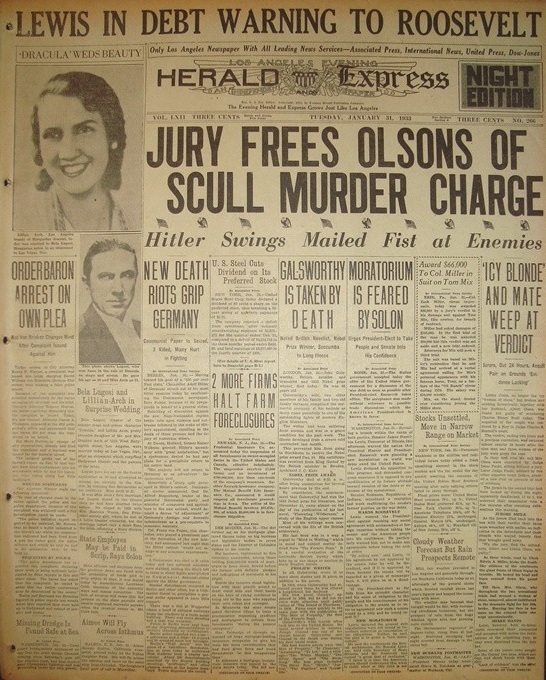 DID YOU read about that “surprise elopement,” quoting the United Press, of Mr. Bela Lugosi and Miss Lillian Arch one day last week? “Surprise elopement,” my eye! That’s putting it far too mildly. It’s positively astounding. 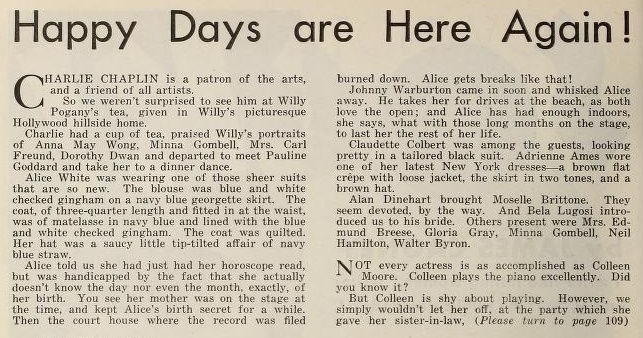 At least it’s astounding to this column and to a certain Hollywood press agent. 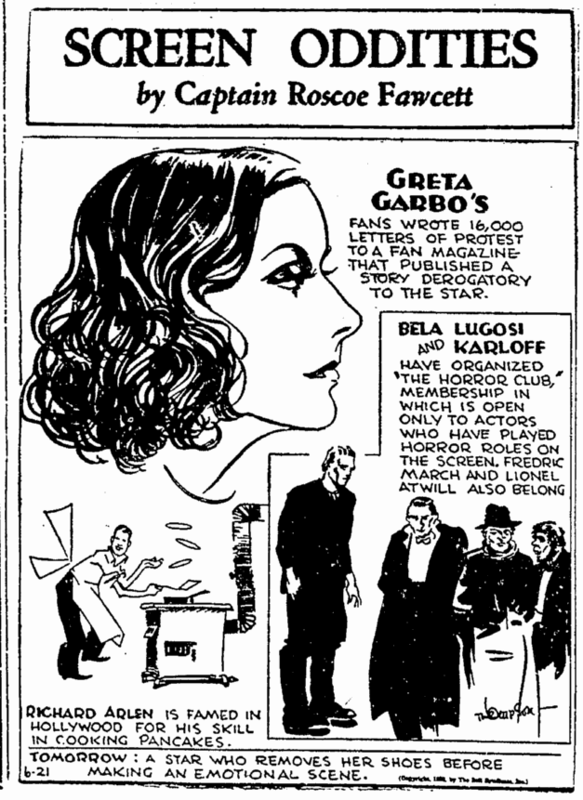 If Mr. Lugosi had been King Tut’s mummy this elopement couldn’t have been more amazing. It completely upset what the sports scribblers so blithely call the dope bucket. That certain Hollywood press agent, now. 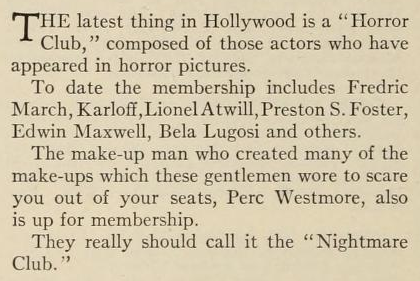 What a whizzer he pulled a few months ago when Mr. Lugosi was busy turning human beings into animated cadavers in that horrendous “White Zombie,” on a local theater screen. The enterprising p.a. 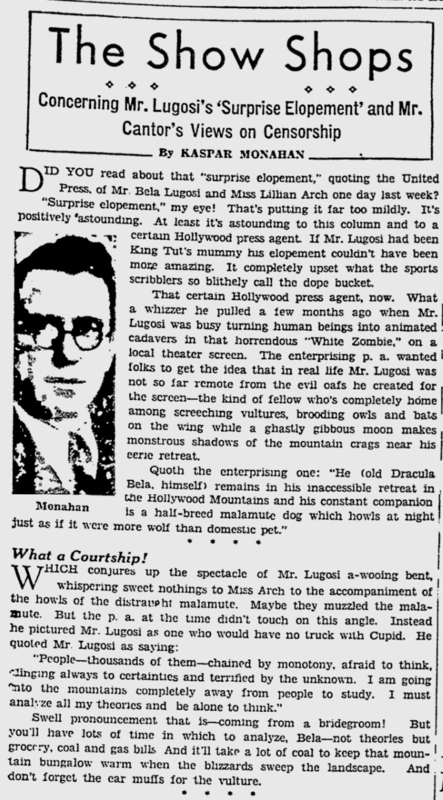 wanted folks to get the idea that in real life Mr. Lugosi was not so far remote from the evil oafs he created for the screen – the kind of fellow who’s completely home among screeching vultures, brooding owls and bats on the wing while a ghastly gibbous moon makes monstrous shadows of the mountain crags near his eerie retreat. Swell pronouncement that is – coming from a bridegroom! 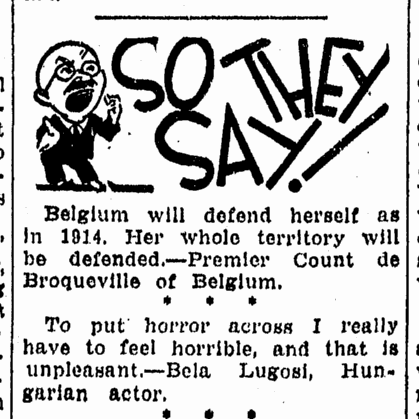 But you’ll have lots of time in which to analyze, Bela – not theories but grocery, coal and gas bills. And it’ll take a lot of coal to keep that mountain bungalow warm when the blizzards sweep the landscape. And don’t forget the ear muffs for the vulture. 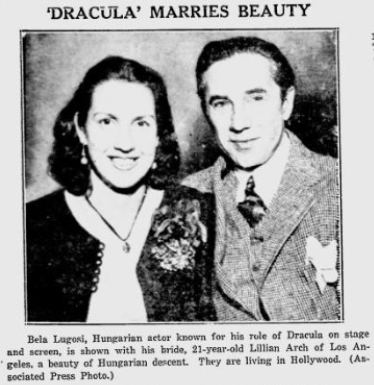 Bela Lugosi, star of “Dracula,” “The White Zombie” and other horror pictures, eloped with Lillian Arch to Nevada.